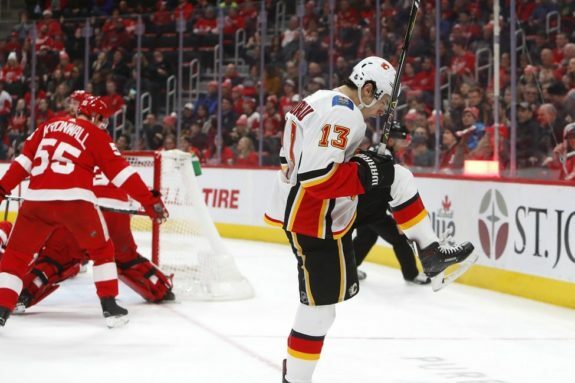 DETROIT — Johnny Gaudreau’s power-play goal with 10:23 left lifted the Calgary Flames to a 5-3 victory over the Detroit Red Wings on Wednesday night. Detroit led 2-0 after one period, but the Flames rallied to hand the Red Wings their sixth straight loss. Sean Monahan, TJ Brodie, Elias Lindholm and Michael Frolik also scored for Calgary. Gaudreau put the Flames ahead 4-3 after a slick play by Matthew Tkachuk, who stickhandled below the goal line and then slipped a pass between goalie Jimmy Howard and the side of the net. Gaudreau was in front to tap in the puck for his 22nd goal of the season. Gaudreau is Calgary’s representative among the Pacific Division All-Stars. The rosters were unveiled Wednesday. Howard made the Atlantic Division team for Detroit. Helm, who missed the previous 21 games with an upper-body injury, marked his return with a goal in the first period. He and Athanasiou came in on a 2-on-1 break. Rather than passing, Helm dragged the puck past a sliding defenceman, switched to his backhand and beat goalie Mike Smith. Brodie’s goal started a wild stretch in which three goals were scored in just more than a minute. Athanasiou had a step on Oliver Kylington when the Calgary defenceman hooked him. Officials awarded a penalty shot that Athanasiou converted for his 14th goal of the season.